The Saltwater Crocodile is the biggest of all the reptiles out there. When you consider how large some of them are, this is a remarkable status to have. The adult males are able to grow about 17 feet and they can weigh over 1,000 pounds. Some of them have been noted at 20 feet and more than 2,000 pounds. However, they are the exception and not the normal size for this type or crocodile. When on land, the Saltwater Crocodile moves along on its belly. The use of energy is very high for this type of movement. That is why they tend to stay in the water. However, they will spend time on land when they need to get more heat from the sunlight. They will also do so when it is time for the females to create nests. There is evidence to suggest that this species of crocodile has been around for about 200 million years. However, there is very little to suggest that they have evolved much at all during that period of time. It is remarkable that they are able to thrive without making such changes. It only further enhances the idea that their complex bodies do offer all they need for survival. They are believed to be very smart animals with the ability to problem solve in a variety of ways. They can easily adapt to different changes in their environment. Experts believe this is why they have survived for millions of years. They are very observant too when it comes to other animals they know they behaviors of certain ones which makes it easier for them to attack. They have a very diverse habitat location in the world. The Saltwater Crocodile is able to live in many different types of water – they aren’t limited to only saltwater but that is where most of them are located. They are also found in various bodies of fresh water out there. They seem to enjoy the warmer temperatures but they can adapt to those that are somewhat cooler if they need so. Most of the Saltwater Crocodiles are found in Australia, India, and Sri Lanka. Exactly how many of them live in a given location is hard to determine because they can spread out. They are aggressive in nature when it comes to others being in their territory. This is why the younger crocodiles continue to move into new areas. They simply can’t compete with the larger and more powerful crocodiles who have already established their home in a given territory. The movement for them though continues to be more difficult than in the past. 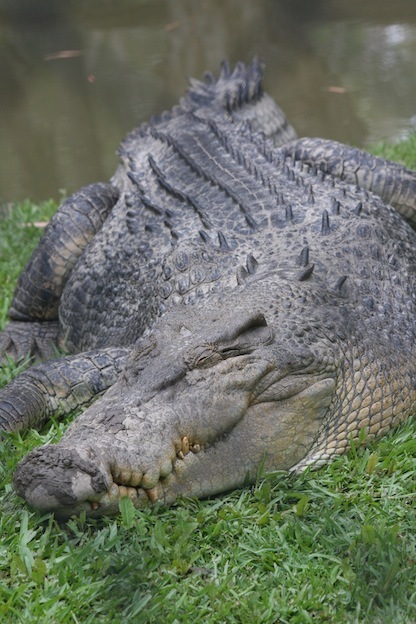 Humans continue to move into land that was once open to the Saltwater Crocodile. As a result they may be killed because of where they end up. As a result less and less of these animals are reaching the age of maturity. 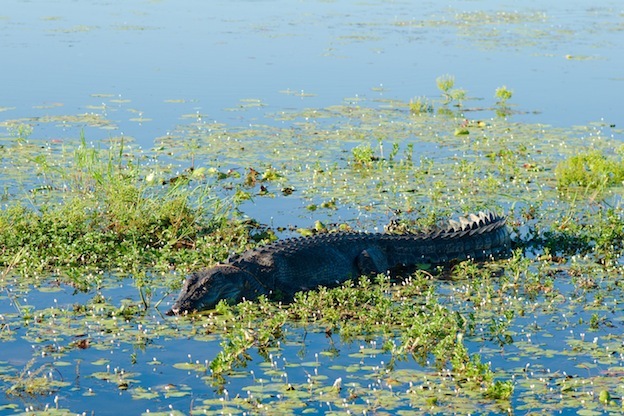 These crocodiles aren’t picky at all when it comes to what they will feed on. Even though they can go for several days without food – they will take what comes their direction. They sit and wait patiently for an opportunity to dine. They aren’t actively going out there searching for food. This helps them to conserve energy and to develop their plan of action. The smaller they are the smaller their prey will be. This includes fish, insects, and other reptiles. As they get larger though they have a heartier appetite. They will still consume those items but also wait for larger prey. This includes cattle, horses, and monkeys. In some areas they have been known to consume sharks and even humans. With powerful jaws and razor sharp teeth they are able to clamp down on the prey that comes into the water. They will place the head of that prey under the water to cause drowning. Since the Saltwater Crocodile can put its body under the water, these animals come to the area to drink or to cross. That is when they are attacked without any idea of what is about to take place. For the Saltwater Crocodile the chance to make doesn’t occur for many years. The males are an average of 16 years old before it occurs. The females are generally about 10 years of age. The males are going to become increasingly aggressive towards each other when it is time for mating. Their battles often can last for hours with standoffs and then one of them will walk away. Very seldom does actual physical fighting result. The female will spend several weeks collecting materials around her environment to create a nest on land. She needs it to be large enough to place 40 to 60 eggs in. She also needs it to be far enough from the water so that the eggs don’t get flooded. It can be difficult for her to make that journey on land so she will only go back to the water when she must feed. It will be approximately 90 days before the young start to come out of the shells. She will carry them in her mouth to the water. She will even break the shells for those she hears if they aren’t emerging on their own. This is where the myth comes in that the Saltwater Crocodile eats her young. Instead, she is doing all she can to help them survive. They have a very high mortality rate with about 99% of them dying. There are several predators to be aware of for the younger ones. They can be consumed by large lizards, birds, and even larger Saltwater Crocodiles if they can’t find other sources of food. As they get larger though there is less of a chance this will happen. However, they do have a serious predator as adults – humans. This particular species of crocodile is believed to be responsible for a higher number of attacks on humans than any other. As a result it is heavily hunted due to fears. People that live in such areas want to get rid of them so that there is less of a risk of such attacks occurring. They also want the thrill of hunting such large reptiles. For the avid hunter the larger the animal is the more of a challenge it seems to bring to the hunt. There are locations where the Saltwater Crocodile is hunted to provide food for the different villagers in the area. It is said to be a very good type of meat to consume. A large one can feed many people for several days. They also use the hide to make goods and the bones from it to create tools. Necklaces made from the teeth of this crocodile are also very common. Today there are about 300,000 Saltwater Crocodiles in the wild. They aren’t in danger of disappearing but the numbers of them can continue to shrink. This is due to their habitat being taken away. It is also due to hunting of them for their hides to make leather goods. Even though such hunting is illegal in many areas, poaching is a serious problem. The desire to make money from the hides is incentive to keep people involved with it.